Massive Parthian / Sassanian stamp seal in Blue Agate! High quality and massive stamp seal, Parthian-Early Sassanian, 1st.-4th. century AD. The seal carved and polished in a particularly fine Blue Agate, a rare stone in this fine colour. Hemispheric form, horisontically drilled, the motif a winged and human headed Bull reclining on a structure with what looks like writing above(?). Size: 26 mm. in diameter and 15,83 grams. Condition: Superb, exceptional with fine ancient wear. Old German Collection, since 1986. 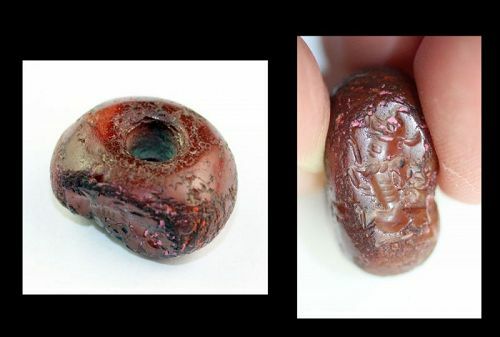 Pair of fine Sassanian Agate & Carnelian Stamp seals! A fine pair of Sassanian Stamp Seals in orange Carnelian and a greyish Agate, 3rd.-5th. century AD. Fine domed seal and a prism shaped seal, both carved with fine representations of animals. Size: 16 mm and 11 mm. in diameter. A scarce and well executed Sassanian stamp seal, 3rd.-6th. century AD. The seal carved in a fine light yellowish carnelian and with a good rendering of a Bull. A scarce and well executed larger Sassanian stamp seal, 3rd.-6th. century AD. 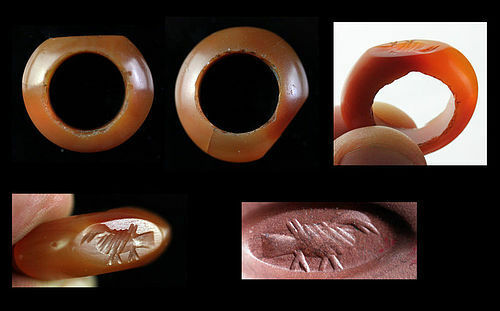 The seal carved in a fine red carnelian and with a good rendering of a reclining Bull. Condition: Verry nice, some overall wear and minor chips. 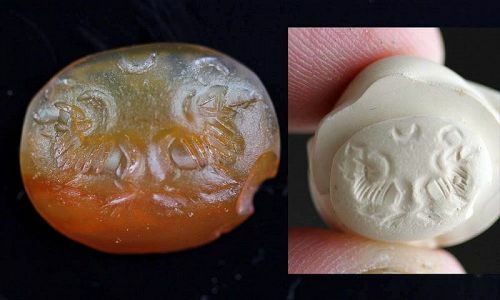 Rare Sassanian, Sassanid Dynasty Rock Crystal Stamp seal! A wonderful and large stamp seal, Sassanian, 3rd.-5th. century AD. Very scarce seal for this size, carved in ROckcrystal and it depicts a fine bird walking. Size: 25 mm wide and 22 mm. high. Condition: Choice, minor chip and wear from use. Ex. Dr. M. M., from Westfalen, Germany, bought 1970. An old collection of 4 ancient stamp seals on a plexi stand! A very rare and interesting collection of 4 ancient seals, ca. 3rd.-9th. century AD. A fine Sassanian glass bottle, 3rd.-5th. century AD. An intact green glass bottle very attractive and quite scarce. The bottle with a tapering neck. Condition: Superb with fine silver irridescence! Ex. Ib Olsen Collection, bought in the Near East in the 1960s. A good style Carnelian intaglio, Early Sassanian period, 3rd.-4th. century AD. Image of two rams, hard imprint included in the sale. Size: ca. 15 mm. Condition: Choice small chip to the rim. A wonderful really large stamp seal, Sassanian, 3rd.-5th. century AD. The seal depicts a Hero or a Demon in the Zoroastrian Pantheon. Carved and polished in a light orange Carnelian. Size: 27 mm wide and 20 mm. high. Condition: Choice, minor wear from use. Scarce Sassanian Stamp Seal in solid silver, 3th.-5th. century AD! A very rare and unusual Stamp seal in solid silver, Sassanian, 3rd.-6th. century AD. The seal in fine pure silver now toned grey, pierced with a large hole and engraved with animal. Ex. German Collection of Dr. M. M., Westfalen, since 1970-72. A large and superbly executed stamp seal with winged beast, Sassanian ca. 3rd.-5th. century AD. This seal is unsually well-engraved for the type and large, done in a very attractive milky white agate stone. Size: 22-23 mm wide. The weight is 12 grams. An interesting ring carved in one piece of carnelian, Sassian 3rd.-5th. century AD. The ring with the engraved image of a bird. Beautiful and meant to have been carried in a string, not to wear. Condition: Choice, patina and some light wear to the inner edge. A very sharp intaglio. 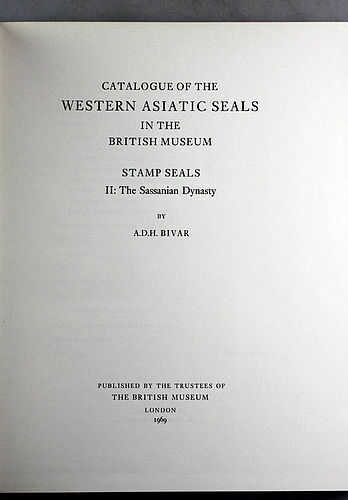 Catalogue of the Western Asiatic Seals in the British Museum Stamp Seals II: The Sassanian Dynasty Hardcover – 1969. by A. D. H. BIVAR (Author). A rare and unusual bronze stamp seal, Sassanian Empire, 3rd.-5th. cent. AD. Sassanian bronze seals are well-known in litterature and in museum collections, but are scarcely encountered in the market in this nice execution and condition! Fine round stamp seal with handle, engraved with an animal motif. Deep relief and very attractive. Size: 14 mm. in height and about 11 mm in diameter. The seal is artfully carved with the image of a bull with large horns, crescent above. A fantastic seal!